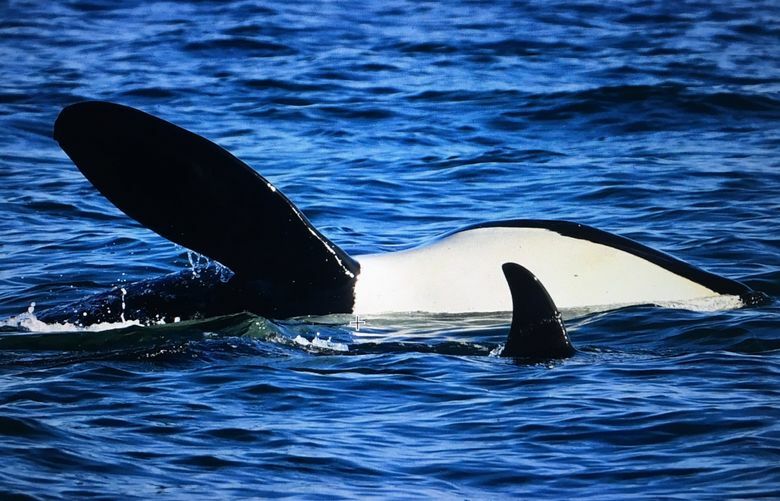 Killer whales K25 and J17 were reported to be in an unhealthy condition earlier this month. The Lummi Nation urged federal officials Wednesday to launch an emergency response to help two ailing southern-resident killer whales — but how do you call for help? The unprecedented government shutdown, continuing into its fourth week, has stymied any attempt by the tribe or veterinarians ready to help killer whales K25 and J17, among the 75 remaining southern residents that frequent Puget Sound. The policy makers and scientists with the National Oceanic and Atmospheric Administration who would approve and coordinate any such response, such as for the emergency rescue plan for J50 last summer, are unavailable during the shutdown. The emergency stranding network operated by non-federal personnel under contract to NOAA is continuing to operate, said Lauren DeMaio, the marine-mammal-stranding assistant under contract for Lynker Technologies. The tribe urges that what was learned in the planning to rescue J50 could be deployed now, before it is too late. “We must act now if we are to save two of our ailing relatives,” Lawrence Solomon, secretary of the Lummi Nation, wrote to Kristin Wilkinson, NOAA’s regional stranding coordinator for Washington and Oregon. The tribe considers the orcas family members. Wilkinson’s email indicated she is unavailable during the shutdown. The one available public-information officer at NOAA for the entire agency could not be reached for comment Wednesday. Marty Haulena, staff veterinarian at the Vancouver Aquarium who helped with the emergency response for J50, said vets are willing to help but need permission to do so from NOAA, and a plan. Why the animals are thin is not known — and that is part of what a veterinary assessment could learn. It may or may not be a matter of not having enough to eat; there could be another cause, such as disease, Haulena said. This would be an even harder rescue than with 3-year-old J50, Haulena said, because they would be working with big adults, one of them a male, rather than a 3-year old — itself an unprecedented effort. In addition, at this time of year the whales also are often inaccessible in winter weather, on the open sea along the West Coast. Ken Balcomb, founding director of the Center for Whale Research, was the first to announce the two whales’ thin condition after seeing them New Year’s Eve. Since then, J17 has further declined, Balcomb said. “She’s going to die. There’s no doubt. I don’t know when, but we are going to lose her,” he said Wednesday. J17 is the matriarch in her family and the mother of J35, or Tahlequah, the orca who raised worldwide concern when she carried her dead calf last year refusing to let it go for more than 1,000 miles. J17 plays an important role finding and sharing food with the rest of her family. A key provider, losing her hunting prowess could hurt the rest of her family, the Lummi Nation warned in its letter. K25 is actually looking better, Balcomb said. “He appears to be holding his own, though that could change at any time.” He said a rescue plan — even if it could be put together — is impractical if not impossible, particularly at this time of year. The southern residents eat mostly chinook, the fattiest salmon of all, though in the winter as much as half their diet can be chum and other salmon.